The changes are dramatic and occurring quickly, researchers found. After a year of record-low ice, wildlife die-offs and warm water temperatures, scientists meeting in Anchorage compared notes and shared research findings about the dramatic changes in the Bering Sea and connected Arctic waters. The region is in transition, heading to a future that is expected to be warmer and less icy than the past, with far-reaching implications for fish, marine mammals, birds and people, scientists said at last week’s Alaska Marine Science Symposium. “What it was like for the last couple of years is not like what it’s been like, but also might not be what it looks like in the future,” said Seth Danielson, a University of Alaska Fairbanks oceanographer and part of a special Arctic Integrated Ecosystem Research program organized by the North Pacific Research Board. Temperature flux — the movement of heat through the ocean — is an important part of that. In one of his presentations, Danielson described how the waters off Alaska are sending more heat into the wider Arctic Ocean. 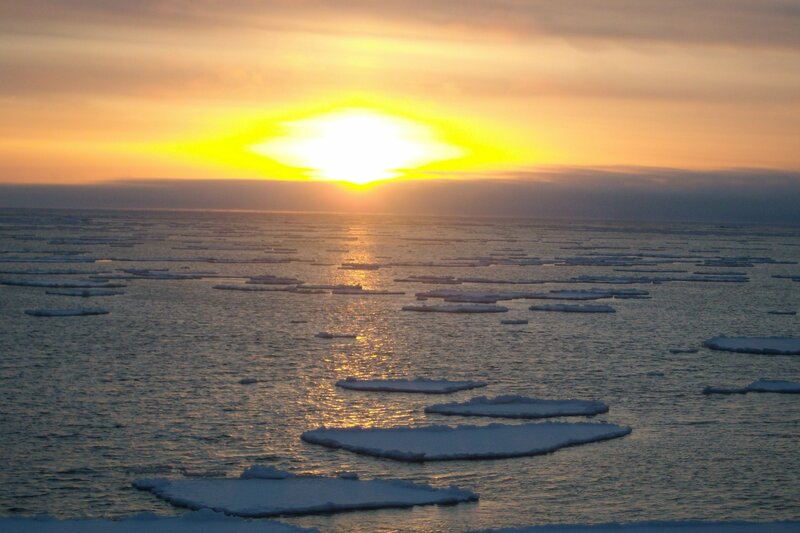 The Chukchi Sea, just north of the Bering Strait, is taking in more heat from both the Bering Sea to the south and the atmosphere above, and it is pumping more of that heat into the higher Arctic waters, he said. “The engine is accelerating,” he said. Preliminary information suggests that the heat flux north through the Bering Strait into the Chukchi has roughly doubled since 2014, he said in his presentation. Though the northern Bering Sea and adjacent Chukchi Sea have swung between cold and warm years in the past, 2014 was the start of a big change, the science shows. Water temperatures have hit higher levels than even in past warm years, and the heat has lingered longer, even at the sea floor. Those past years show a strong pattern, Danielson said in a presentation. In 2014, water near the sea floor was warmer than 0 degrees Celsius only fleetingly. The following year, temperatures of those deep waters were above 0 for two months. In late 2016, temperatures near the sea floor were above 0 degrees Celsius for three months, and in late 2017, the stretch was four months. Warmed-up temperatures deep in the sea, in turn, led to a profound change in the northern Bering Sea: the absence in 2018 of a pool of ultra-chilled water — referred to as the “cold pool” — that separates lower-fat southern species from higher-fat northern species. Usually when the Bering Sea water freezes, that expels salt that allows water to be extra chilled, creating the cold pool that serves as a liquid barrier separating northern and southern species. When sea ice melts in the spring and summer, a layer of freshwater forms atop the heavier saltwater. In fall, when storms blow in, the layers mix, allowing the freeze cycle to start anew. But the winter of 2017-18, with its lack of sea ice, threw that cycle out of whack. The usual cold pool never developed. On top of the gradual warming trend in the climate, last year’s record-low sea ice was the product of unusual winds from the south bringing heat to the Bering, said Thomas Van Pelt of the University of Washington. The Bering Sea cannot start to freeze until after the Chukchi Sea starts to freeze, and last year’s Chukchi freeze-up was extremely late and its spring melt arrived early, Van Pelt said. That set up an extraordinarily vast section of Bering Sea water that remained ice-free for an extraordinarily long period, upsetting the usual order, he said. The new pattern will not be so unusual in coming years, he said. Climate models project more frequent southerly and warm winds coming into the Bering and Chukchi, he said. “So winters like what we experienced last year are predicted to become more common,” he said. Van Pelt presented findings on behalf of his science colleague, Phyllis Stabeno of the National Oceanic and Atmospheric Administration’s Pacific Marine Environmental Laboratory in Seattle. Stabeno, an oceanographer and an expert on the Bering Sea cold pool, was unable to present because of the month-long partial shutdown of the federal government. Though federal scientists based in Alaska did make the conference, those based outside of Alaska — notably, Stabeno and her Seattle-based NOAA colleagues — were prohibited from attending. In some cases, their non-federal research partners presented study findings. In other cases, presentations were withdrawn, or late substitutions were made. Among the skipped presentations was a summary of NOAA seal observations showing what appear to be hard times for ice-dependent seals in the northern Bering Sea. Surveys taken in April of 2018 — a year when the edge of sea ice was 375 kilometers farther north than ever recorded and when conditions approximated what is expected in about 2050 — showed a deterioration in conditions from those found in spring surveys of 2016 and 2014, the abstract for the skipped presentation said. In 2018, ribbon seals were almost absent, and data from those seals that could be measured showed lower weights and thinner blubber layers. Also affected are seabirds. Mass seabird die-offs are becoming more common, hitting nearly every year and affecting the Bering Sea in particular. Prior to 2006, there were bird die-offs about every five to 10 years, said Timothy Jones of the University of Washington. “So a frequency of almost every year throughout the North Pacific represents a real increase,” he said. The Bering Sea warm-up appears to have been devastating for the long-monitored black guillemots that next each summer on Cooper Island in the Beaufort Sea. Those birds, studied for nearly half a decade by biologist George Divoky, spend their winters at the Bering Sea ice edge, which last year was far north of the preferred food-foraging area. This year, the colony suffered its worst adult overwintering mortality since 1976, with about a third of the breeding pairs failing to return in summer. Of those that did return, only two-thirds of the nesting pairs produced eggs, and half of those eggs failed to incubate.